Last week I began my first of several Japanese tour guiding trips this summer. I love working outside, speaking Japanese, seeing beautiful scenery and hanging out with people. 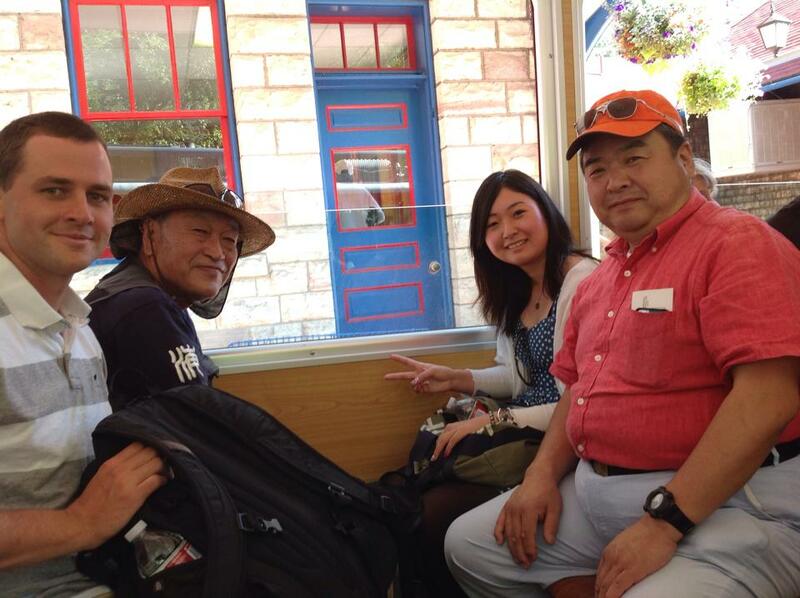 The first day I took 15 Japanese guests to Pikes Peak, Garden of the Gods and the outlet mall in Castle Rock. They loved Pikes Peak, but to my chagrin, we only did a drive by of Garden of the Gods… to allow more time for the outlet mall. It’s not what I would choose, but I suppose the customer is always right and there really is nowhere like America for cheap brand name omiyage (gifts). The second day, one of the guests asked me to translate, as an American family who had stayed in his house in Japan wanted to show him around Denver. Since his English and their Japanese were basic at best, he hired me! It was a great experience, although I stumbled my way through the Denver Museum of Natural History. Somehow in all of my years of living in Japan, I failed to learn sciency terms like cyclocilicates, stalagmites and carbon dating of dinosaur fossils. I’m learning that as a translator, knowing where you’re going is crucial and google translate is a lifesaver. In traveling around the world and working as a tour guide, you learn what you want from travel, and realize that people have different ideas about what travel should entail. Many Americans, for example, go to Mexico or Hawaii or Florida for the sole purpose of doing absolutely nothing except getting a tan while sipping margaritas by the pool. That’s nice for a time, but I can’t imaging going somewhere and only seeing the inside of a resort. Japanese, on the other hand, cram in as many famous sites as possible, taking thousands of pictures in the process. They see a lot of things in a short time, but for me it’s a little fast-paced and touristy. I would comment on Kenyan travelers but since most Kenyans can’t afford it, their travels involve riding a crammed bus “up-country” to see their relatives for Christmas. So what is my travel philosophy? Cliche, but I think it’s all about the people. Whenever I go somewhere, I make sure I know someone. Not only is it cheaper, you also experience the real place with a little adventure, local cuisine and fascinating conversations thrown in. In Mexico, I remember partying with couples in their 40s until 3:00 AM as this old dude explained proper tequila drinking etiquette to my dad and I. In Damascus, I went to a Turkish bathhouse where a huge Syrian guy “massages” you by karate chopping your back, cracking your neck and rubbing uncomfortably far up your thigh – sort of a martial arts chiropractor masseur. While studying abroad in Cairo, Egypt won the Africa cup of Nations. Breaking the rules, a friend and I participated in the celebrations, where people danced on cars, spun machetes, pointed flamethrowers in the air, and circled around the Americans to watch us dance. Yes, I’ve experienced some crazy things that probably weren’t the safest, but I wouldn’t trade those memories for the world. 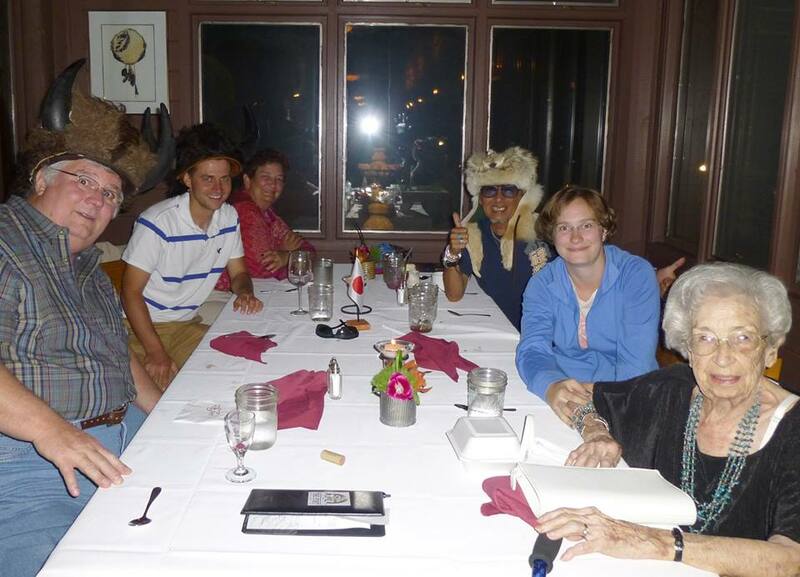 This entry was posted in Travel and tagged America, Colorado, Damascus, Denver, Japan, Kenya, Mexico, Pikes Peak, Reflections, Stories, Syria, Throughts, Tourism, Travel, Writing by Daniel. Bookmark the permalink. My travel philosophy is to soak in a city. I grew up with parents who vacation as if they’re Japanese, only with longer vacations. But even then I remember that my favorite locations were the ones where we stayed in the same motel room for multiple days. I like absorbing the locality. To spend time just walking through the streets. Discovering a cute coffee shop or a grocery store I can become a regular at for just that week. Going to church not because it’s a beautiful cathedral but because people are worshiping there. And, hopefully, meeting a local or two in the process. I did not know that I was a traveler before because I did not think that those trips up country and back to the city in my earlier years could be termed as travel. I should have known, because no single trip was ever the same, As I grow older, I appreciate travel, in the deeper sense. Recently I have left Africa for the first time to go to Sweden and I learned that no peoples are the same. And in some places you will always be different, but its soo great to know that I can always come back home. So I do not have yet a travel philosophy yet but I will be looking into that for sure.. thanks for making me look inside. As circumstances keep my travels to usually about a week at a time, I know I’m not ever going to really “know” the place that I visit. But, since my chosen pursuit is photography, I travel because it wrenches me completely away from my everyday, opens my eyes and heightens my senses. It’s a challenge to go to a foreign place and try to come away with shots that haven’t been taken a million times before by as many people. The experience is always humbling, stressful, upsetting, exhausting, yet ultimately rewarding. My travel philosophy is simple: people, food, and history. If I travel to a country that a friend lives in, I would definitely love to spend time with my friend. To do things together, take pictures, create memories and experiences. To write our own history. I enjoy going to the market, learn about their culture, taste their traditional food, walk in the street where millions of people have walked before me, and enjoy the nature. From the experiences I learnt when travelling is that you can go to famous place with friends, like the Eiffel Tower, and you take pictures with the Tower. After the trip when you look at the pictures, the first thing you will appreciate will be your friends and the things you did with them in that place, like a picnic. A place is just a place (with history), but the things that you remember are the experiences. For me, travel is all about making friends. Friends from other cultures teach us so much about the world. I honestly think if everyone traveled the world would be much more peaceful and understanding of cultural/religious/philosophical differences. I can’t imagine going somewhere just to do nothing! I guess everyone is different though, if they have a very stressful home or work life maybe they need it. For my husband and I, the very best kind of travel is going somewhere challenging and living there for a time, preferably 2 – 3 years. The knowledge seeps in slowly, with each visit to a local market, learning the customs and etiquette of the place, even learning the body language of a place. On our non-living travels, we prefer road trips, time on the ground. One of our first stops is always a supermarket; we go where locals go and see how they are living. Usually people are willing to share with you if you are truly interested in listening to what they have to say. Alpha (above) says people are very different; my experience is almost entirely the opposite – we are all more alike in more ways than I ever thought possible, and most of our differences are stylistic, even when deeply held beliefs are involved. Parents love their children. People have to eat. It’s good to have a roof over your head. Life goes more smoothly if we all try to get along – those kinds of things we all have in common. Mostly, for us, travel is about learning to think in new ways, and to see through new eyes. I cannot but comment as this is an important question to me that I keep always on my mind and discuss with myself and others. As many have answered here, my travel philosophy talks about some of the same things and some more which has not been named yet, probably. 6. Absence of planning: avoiding time restrictions and defining routes. This is what made me start My Big Trip after I suffered from my pre-planned one month trip in India once. I have been learning to trust my inner voice and do what it says in the moment. It may be staying at some place longer because i liked the place or I met someone nice there, or going to another place I have even not thought of, because there is someone going there and I feel like joining. Getting to know the landsacpe is important to me.